Some of the Best Longboards for Beginners - Riders Choose! Best Longboards for Beginners. Rider’s Choice! There are many brands and types of longboards available in the market. However, they are meant to cater for different types of riders. Some longboards favor certain styles. Others are more suited to riders of a certain level of skill. For beginners, it is important to know which kind of longboard is best suited to your needs. This is because selecting the proper longboard goes a long way towards helping a rider get better and making for great longboarding experiences. It can also save one money down the road and affects how fast a rider learns new skills and tricks and advances their skills. When selecting a longboard as a beginner, it is important to keep in mind the most important requirements. They include stability, smooth riding and a durable board well-suited to cruising. When selecting longboards for beginners, one has to ensure that the board provides a safe and great longboarding experience. The board should therefore be stable and the riding experience smooth. 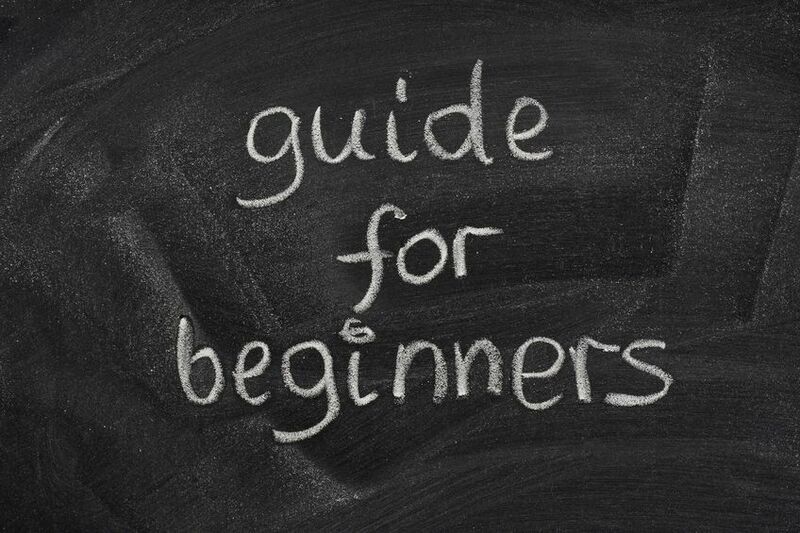 It should be easy to use and well-suited to cruising, which is the predominant style used by beginners. Additionally, the boards should be affordable while at the same time being durable. Whenever possible, the longboard should be versatile enough to handle different styles of longboarding. This ensures that the rider does not have to invest in a new longboard each time they want to advance to a new style of riding. Furthermore, it enables the rider to handle more difficult techniques and tricks with a board they are already familiar with. Listed below are some of the best longboards for beginners based on safety, ease of use, affordability, versatility, durability and stability. Made of bamboo and hardwood maple, the 44-inches long board is perfect for beginners as it is great for cruising, transportation and street carving. It is durable and flexible and comes with a kick tail for performing balancing tricks and kicks. This makes it an ideal longboard for a beginner for cruising and learning freeriding. Coming with a classic pintail design and a unique shape, the Yocaher Punked Stained Pintail Complete is one of the best longboards for new riders. The board’s unique shape gives a rider ample foot space and prevents the board from connecting with the wheels. One of the greatest feature of the board is in the design of the trucks and wheels. The board comes with one speed rings which shield the ABEC-7 bearings from the larger axle. It features trucks that are 180mm long with a diameter of 8mm, making the board extremely stable and the ride safe and smooth. The New Cruiser Through Longboard is designed primarily with cruising in mind as the name suggests. It features a deck that is 9.5 inches wide and has a versatile design. This gives riders a lot leverage while turning and carving while ensuring the rider does not expend too much effort while cruising. It combines different elements of design geared at ensuring the rider enjoys a smooth and stable ride while also being safe. This is a great longboard for new riders since they can use it safely and have a great longboarding experience without compromising on safety. The unique and versatile design is also a great investment as riders can use the board when they advance to freeriding and performing more advanced tricks. The Atom Pintail Longboard is one of the best longboards for beginners. Atom longboards are not the cheapest and require substantial investment on the part of the rider. However, almost all riders who have ever used an Atom longboard agree that it is worth every penny spent on acquiring one. The board comes with a classic design and shape making it well-suited for those who love the classic design. The Atom Pintail Longboard comes with a pintail shape that tapers off at the edge and is widest at the center. 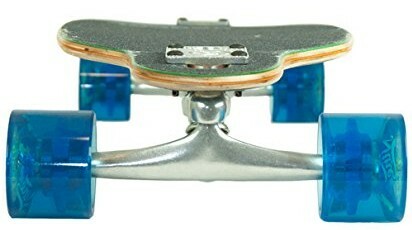 This ensures that there is no wheel bite and gives a beginner rider a better orientation of the center of the board. 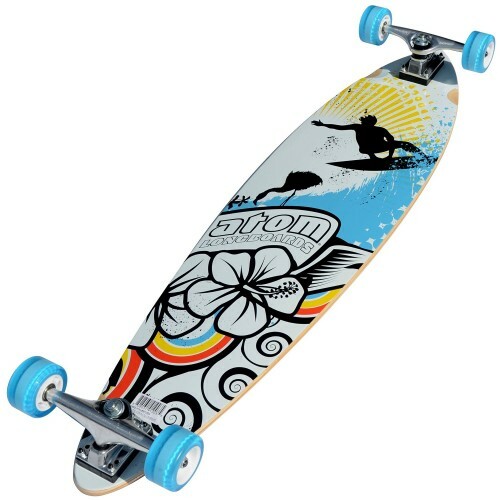 The board is 9.4 inches at its widest point and 39 inches long, making it ideal for stability and control while cruising. With aluminum trucks and urethane wheels, the board is affordable while being durable and strong though by no means suitable for downhill racing. The Yocaher Professional Speed Drop-Down Stained Complete is suitable for both professional level riders as well as advanced beginners. The longboard weighs about 8 pounds and measures 41.2 by 9 by 5 inches. The wheels have a hardness level of 78A and it includes an 80A black grip tape for better stability. It is made of 9-ply Canadian maple which makes it extremely stable even at high speeds and durable. Stability is increased by the drop-down design which also makes it ideal for cruising. The durable wheels and trucks, chrome bearings and general designs makes it ideal for beginners interested in learning and using more advance longboarding styles or who want to try their hand at downhill bombing. A concave deck design eliminates wheel bite. Overall, it is a great longboard for newbies interested in improving and advancing their skills. This a truly versatile longboard that is suited for riders of any skill level or style. The board features smooth bearings sidewinder trucks. This gives the rider great control while ensuring the ride is smooth. 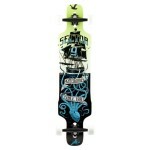 It also makes the board ideal for any style of longboarding from cruising to downhill longboarding. 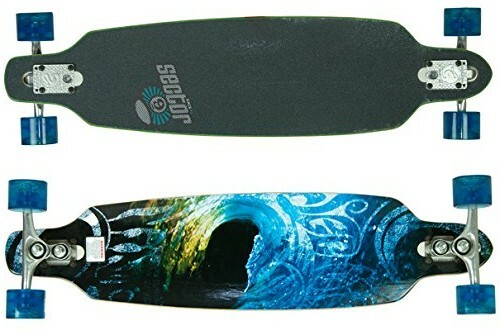 The board at 36 inches features a variation of the concave design which combined with the drop-through deck style gives the board great stability. It also provides the rider with great versatility and helps in preventing wheel bite. This is a great board for beginners since they can use it for any style of longboarding they want as their longboarding skills advance with time. In conclusion, selecting a longboard for beginners is by no means an easy task. There are different tradeoffs to be made. The best longboard for a beginner depends on different factors including the desired longboarding style and terrain. 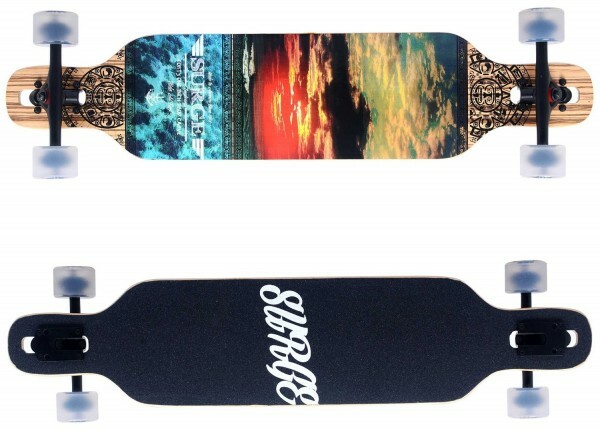 Ultimately, the best longboard a beginner can get depends on their desires and needs.